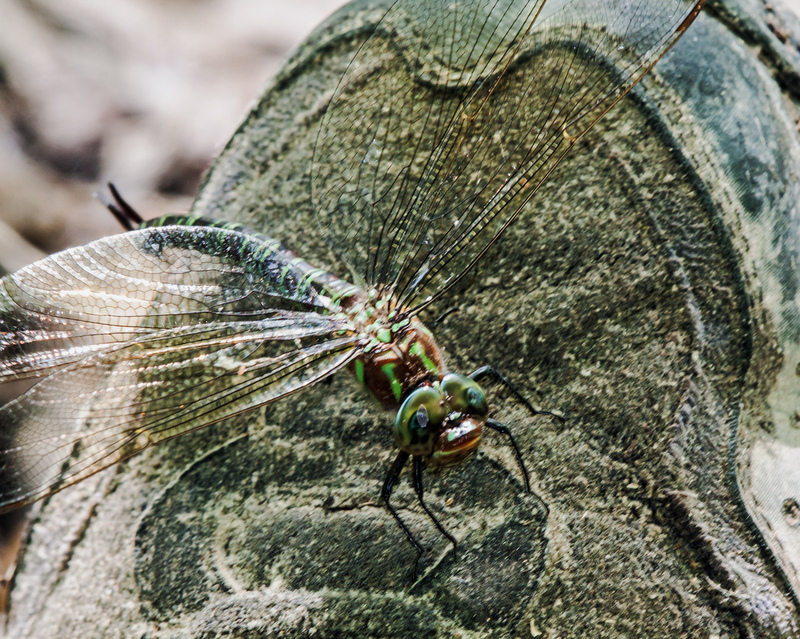 The weather yesterday was hot and sunny—perfect for dragonflies, although a little uncomfortable for me. I decided to search in the vicinity of a vernal pool, one of my favorite spots for dragonflies at Huntley Meadows Park. As I was walking along a small water-filled ditch, a large dragonfly flew up from the water and perched in a tree just a short distance away. 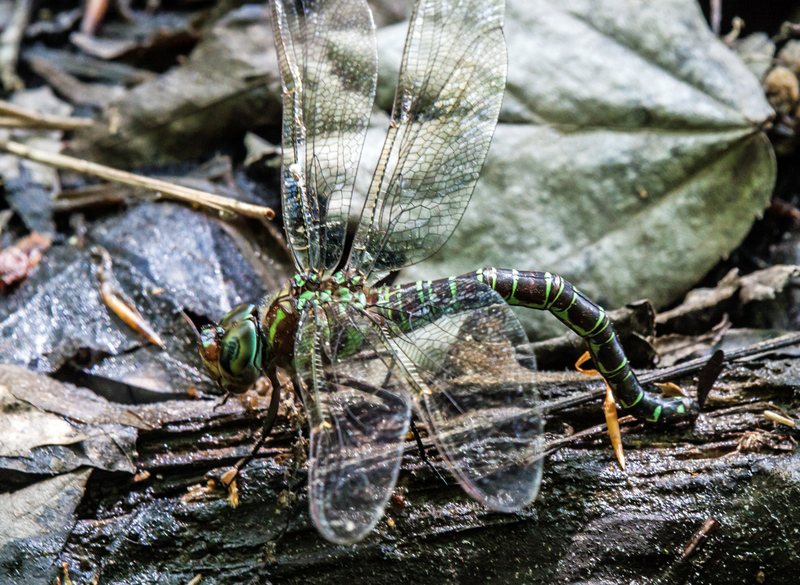 I suspected it might be a Swamp Darner (Epiaeschna heros) and it turns out that I was right. About this time each year, a number of female Swamp Darners descend on this small ditch to lay their eggs. 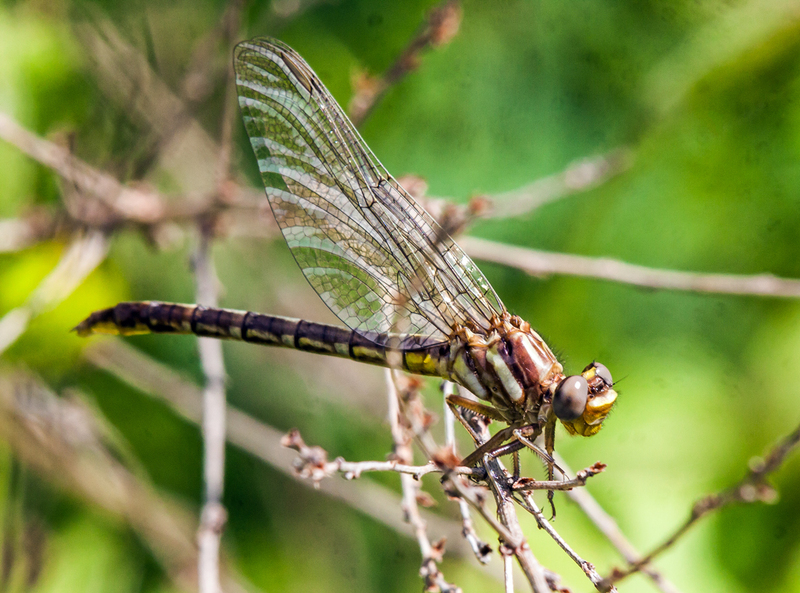 Unlike many other dragonflies, which lay their eggs in the water, Swamp Darners lay their eggs in moist, often rotten logs. Essentially they tunnel into the wood before they lay the eggs. I spotted the most likely target log and sat on the bank of the ditch to see if the dragonflies would come. It didn’t take long for them to arrive. 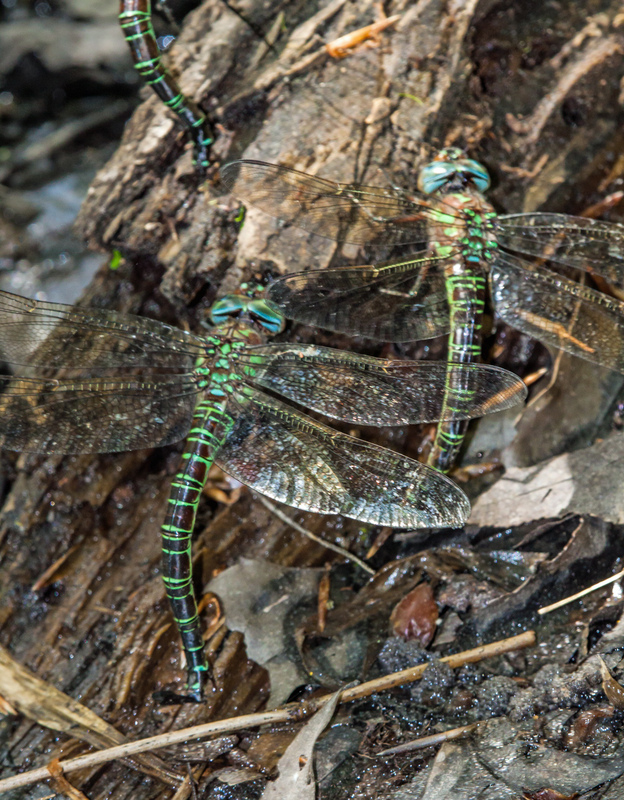 Sometimes it was just one dragonfly, while at other times there were two or even three of them laying eggs in the same log. I was shooting with a 180mm macro lens, so I could not zoom out to include all of them (and I did not want to move for fear of scaring them away). In one of the photos, you can see two of the Swamp Darners in action and part of the abdomen of a third one in the upper left corner. I don’t know if it is some biological imperative for species preservation that compels them to deposit these eggs, but the females were putting them everywhere. I was a little shocked when one of them landed on my mud-covered shoes and began to deposit eggs there. The dragonflies were so focused on depositing their eggs that I was able to lean forward and get a close-up view of the face of one of them. 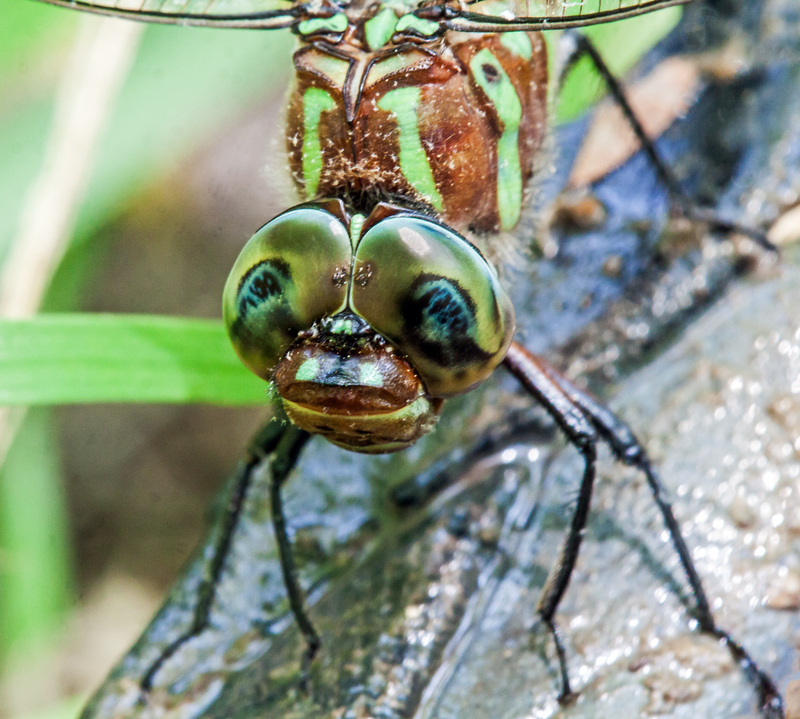 I love dragonfly faces and especially their amazing giant eyes. 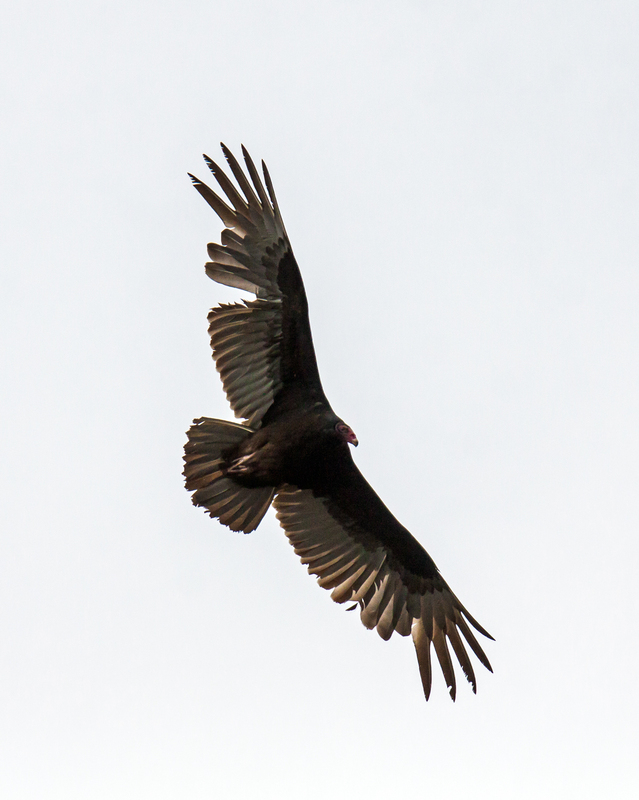 As this Turkey Vulture circled overhead, I couldn’t help but notice the large gap in its wing feathers. Some birds seem to fight with each other, which cold account for the missing feathers, but I don’t recall ever seeing a Turkey Vulture squabbling with another bird. What would they fight about? Territory? Food? Despite the gap, the vulture seemed to have no trouble flying and its wingspan was still pretty impressive. 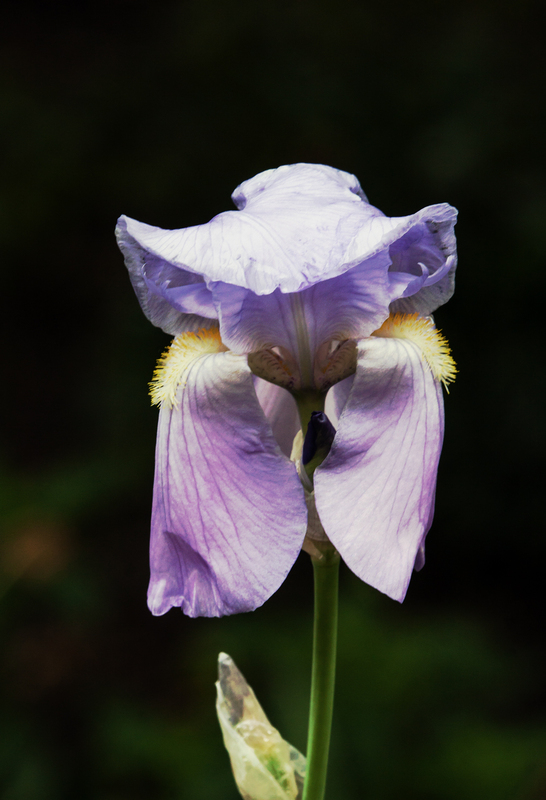 Is it just me, or does this iris make anyone else think of a rather elegant lady with a broad-brimmed hat? There is just something whimsical about the position of this rather ordinary flower that brings a smile to my face. I don’t have my own garden, but fellow photographer and neighbor Cindy Dyer has all kinds of flowers in her garden. Her irises have just started to bloom and I walked by her townhouse recently and spotted this somewhat faded iris and took this shot. 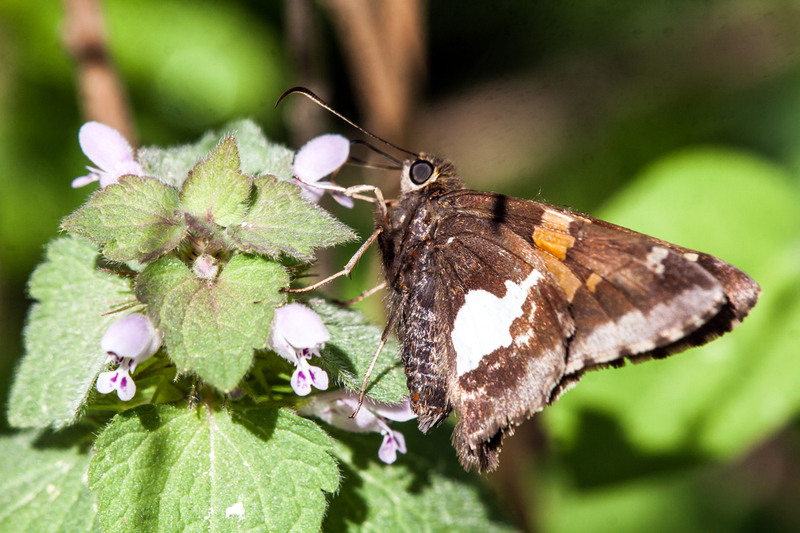 Out of the more than 3500 different species of skipper butterflies worldwide, according to Wikipedia, there is really only one that I can reliably identify—the Silver-spotted Skipper (Epargyreus clarus). 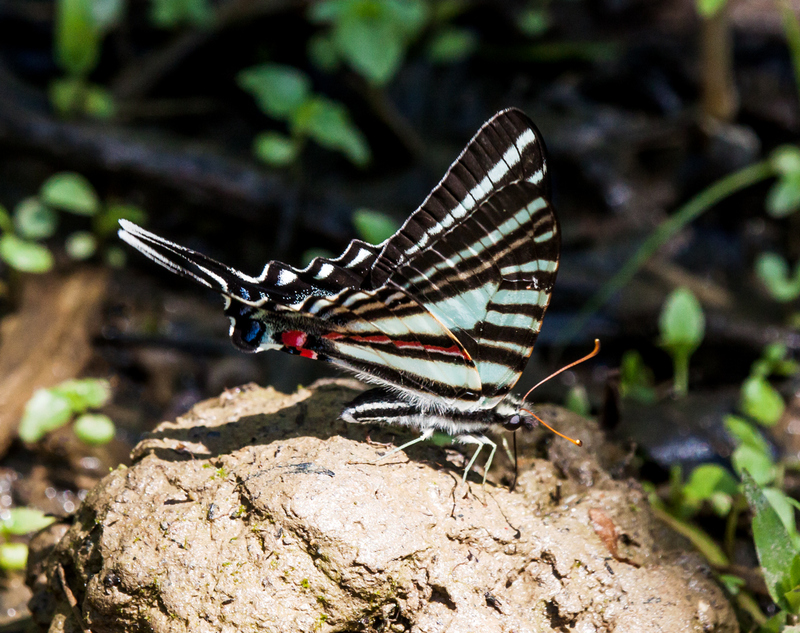 I spotted this beautiful little butterfly this past weekend at Jackson Miles Abbott Wetland Refuge. The skipper was so intent on feeding that it let me get pretty close to it. As a result, this image is one of the rare cases when I didn’t feel a need or desire to crop at all. I am not very good at plant identification, but I really like the tiny flowers of the plant in this image. 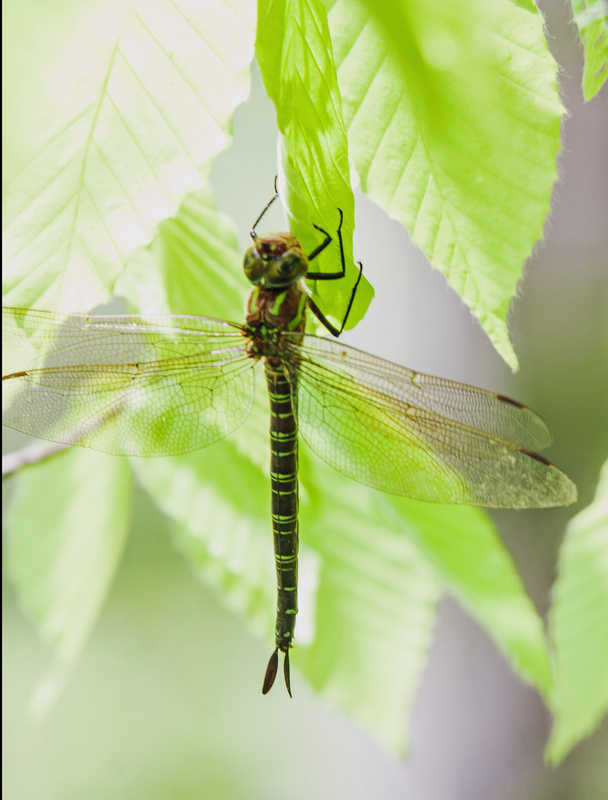 During the summer it seems like dragonflies are everywhere, perching prominently in plain sight, but this early in the season there are a whole lot fewer of them and the ones that are around are hard to find. 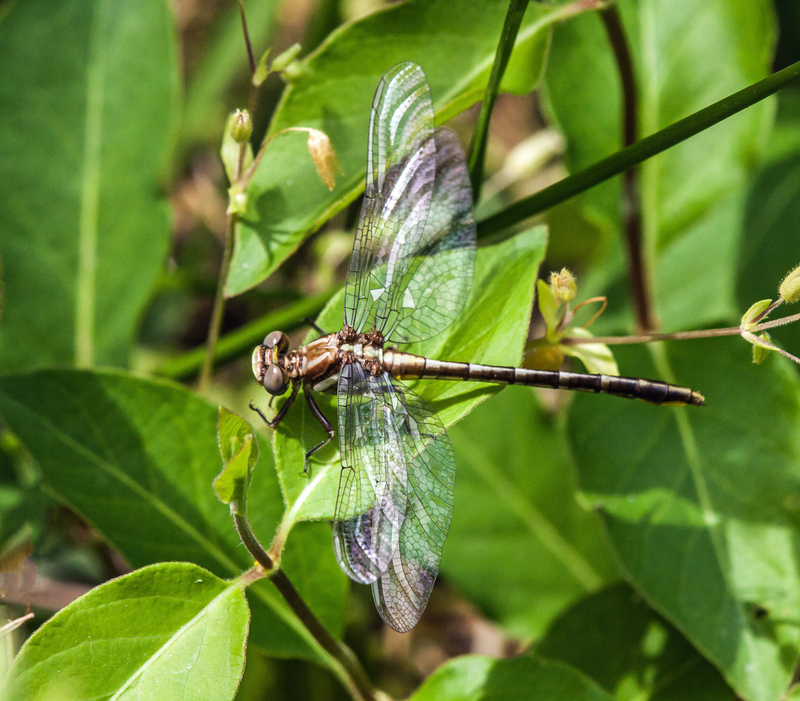 Fellow dragonfly enthusiast and blogger Walter Sanford recently did a posting about some Ashy Clubtail dragonflies (Phanogomphus lividus) that he had spotted at Jackson Miles Abbott Wetlands Refuge. I had never seen this species before, so I set off this past Friday to see if I could find one of my own. Walter had alerted me to look for the Ashy Clubtails perched in the grass and in the low vegetation that surrounds the small pond at the wildlife refuge. I circled the pond several times in vain before I suddenly caught sight of some dragonfly wings shining in the sunlight. 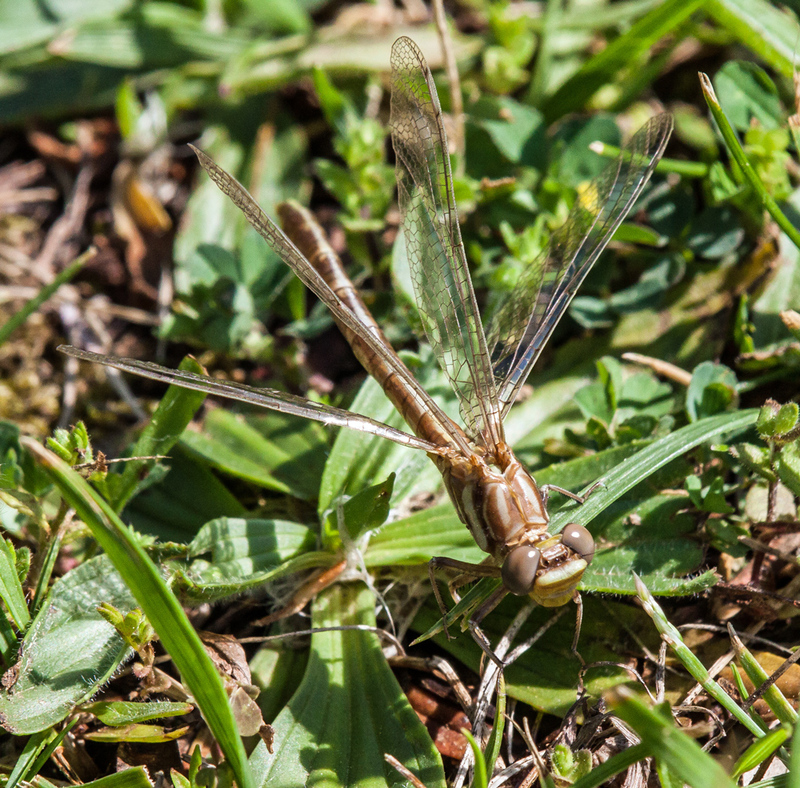 I was able to track the dragonfly during its short flight and saw where it landed in the grass. Almost certain that I had found an Ashy, I approached the dragonfly slowly and cautiously, fearful of scaring it away before I could get a shot. I was face-to-face with dragonfly, which is not the greatest position for capturing its details, and was able to confirm that it was an Ashy Clubtail. 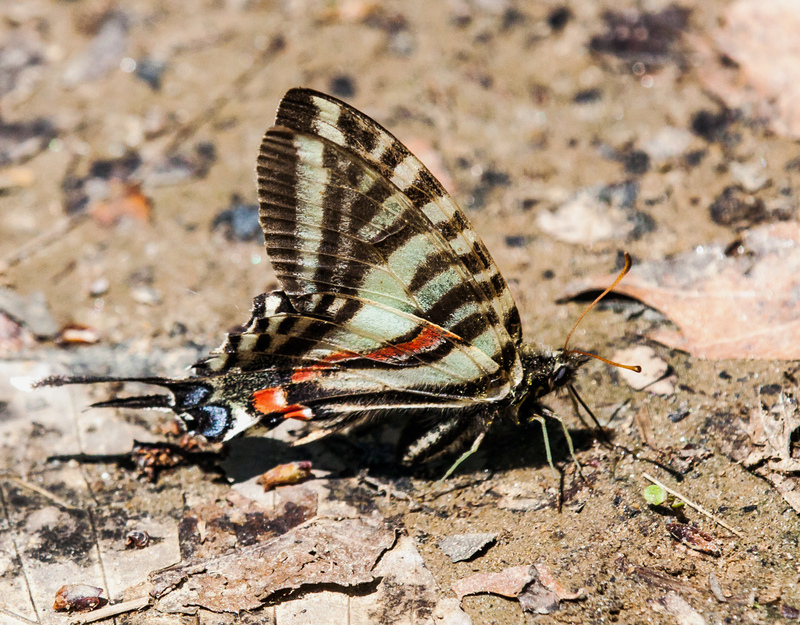 Its pale coloration and very clear wings indicate that it is newly emerged, what is often called a “teneral,” and it looks to be a female. Having gotten a few shots, I tried to get a better angle and spooked the dragonfly. Buoyed by my success, I was motivated to search even harder and eventually spotted two more teneral female Ashy Clubtails. One was in some chest-high thorny bushes and I had to push up against them to get as parallel as possible with its body for a detailed shot. I was able to photograph the third Ashy from almost directly overhead and the final photo gives you the best overall view of this beautiful dragonfly. These Ashy Clubtails ares not as brightly colored as some of the dragonflies that will appear later in the summer, but they were definitely a welcome sight for me. It’s springtime and love is in the air. 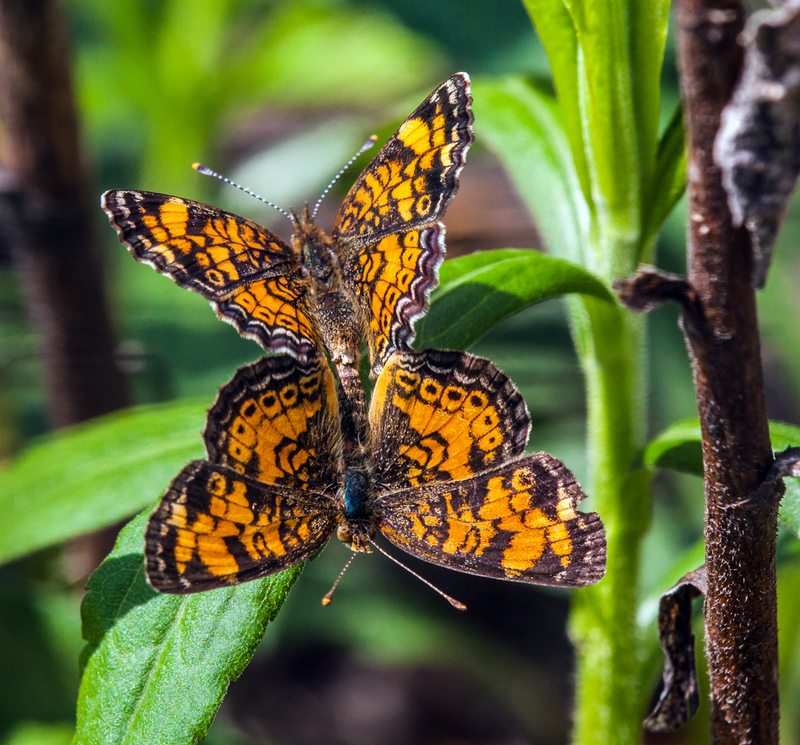 So many creatures seem to be searching for mates and some of them have obviously found one, like this pair of Pearl Crescent butterflies (Phyciodes tharos) that I spotted in flagrante delicto at Jackson Miles Abbott Wetland Refuge in Northern Virginia this past Friday. 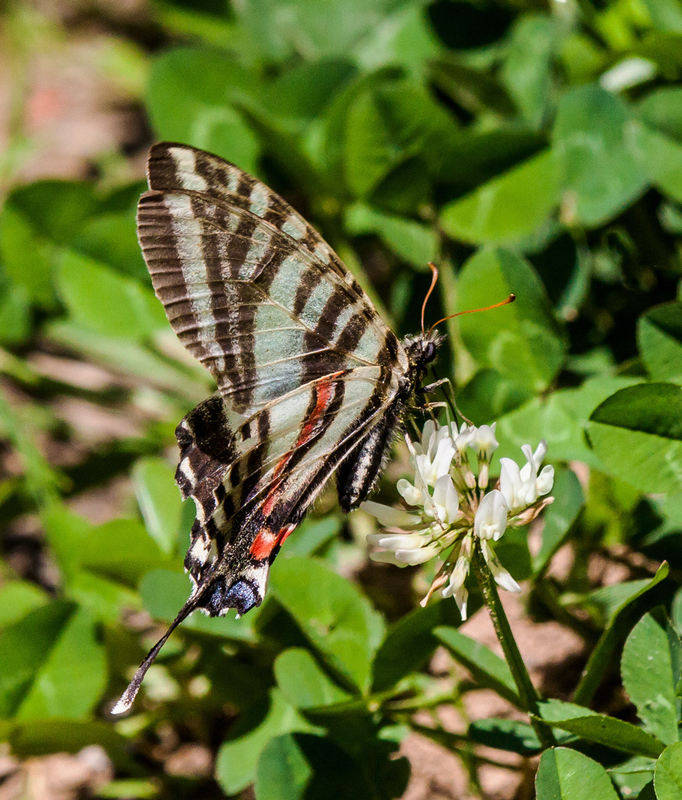 I am no expert in butterfly anatomy and have no idea how this works, but there is a real beauty in the position, which appropriately looks to me like a double heart. What can I say, I am a romantic at heart.